Pair with our vintage period designs for a stylish lockset. 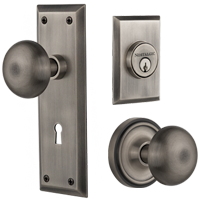 The Nostalgic™ patented vintage style deadbolts feature forged brass construction and high quality internal components for smooth, long lasting operation. The door locks are available as single or double cylinder and match many of our most popular vintage, period designs. They are perfect for restoration, easy to install on modern pre-drilled doors, feature a 1-inch hardened steel bolt and are available in multiple finish options.